DNS Hijacking also termed as DNS Redirecting or DNS Poisoning, is a stratagem used by cyber pillagers by which they trample upon a computer’s IP settings on the Internet to block access, restrict, and censor content. By overriding a computer’s IP settings, the hijacker directs it to a rogue DNS server instead of the user-friendly domain names. This can also be achieved by monitoring and probing directly on the traffic at imperative routing spots. The Great Firewall of China, which is used by the government to achieve Internet censorship in China, is the biggest example of DNS hijacking. Domain Name Service is abbreviated as DNS. It is an Internet service that translates URL such as Google.com to an IP address such as 8.8.8.8. Every website has an IP address that is linked to its URL via DNS. The DNS server holds a record of the IP address of every website along with the corresponding URL. Here, the URL depicts the name and the IP address depicts the address just like a phone book holding record of the enlisted people with their address. Many companies publish the website’s DNS address and an algorithm, along with it, that keeps them updated at the same time. The DNS system is functioned by your ISP (Internet Service Provider) and many other private business organizations. Your computer is configured as such so that it uses the DNS server from the ISP. But these settings can be changed manually. When you enter a URL into the address bar of your browser, it is sent over to a DNS server to resolve into an IP address hence mapping you to your friendly domain names. However, due to inadequate check and balance often a wrong DNS server is reached. The DNS hijacking might be done by an attacker, functioning in between the computer and the DNS server from a rogue device. If that’s the case, then the DNS server is now owned by the hacker as he might have changed the DNS settings and gained access to your computer. Now comes the point where the DNS server contaminates its records by swapping the IP addresses of the sites you wish to visit with those of another site that might be already infected with malware. If DNS hijacking is being carried out by an experienced hijacker then he might masquerade websites, as a result, he may compile sensitive information of users as well as the passwords and IP addresses of many websites. In many cases, DNS hijacking is also carried out by the use of sophisticated malware such as a trojan horse. 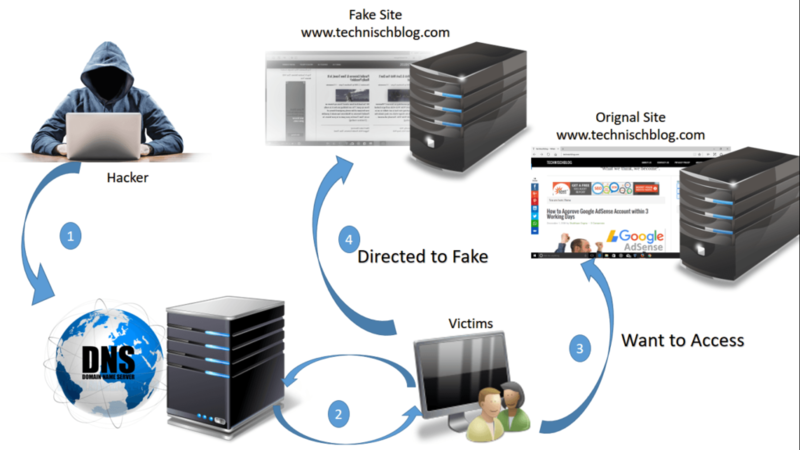 The DNSChanger trojan is a form of malware that profited about 14 million USD by hijacking the DNS settings of over 4 million computers through deceptive advertising revenue. Internet censorship is enforced by many countries that require Internet Service Providers to cut off some specific domains from their DNS servers. However, this is a comparably an easy form of hoodwinked censorship. On the other hand, when the whole network is operated by a hijacker he can restrict and block contractual DNS servers entirely or he may apply Deep Packet Inspection to specifically block or misdirect requests. After going through the dangers you are exposed to with DNS hijacking, we will share with you the easiest way to prevent DNS hijacking. Domain Name System Security Extensions abbreviated as DNSSEC can be considered as a DNS hijacking analysis that is not just used for verification of the integrity of DNS server but also for the protection purpose. DNNSEC minimizes the chances of a hijacker to masquerade a DNS but it is a tough job for a user to set up, validate and monitor, unlike HTTPS in web servers. A good antivirus program can protect your computer a great deal against such attacks but keep it updated is of prime importance. To avoid censorship by your local Internet Service Provider, you can change the DNS server. Strong privacy concerns are related with opting the correct DNS server as each domain will be seen by them that you try to connect to. But eventually, this power will be withdrawn from the hands of your Internet Service Provider for a strong cause. You may change your DNS server to an autonomous DNS service like OpenDNS or Google DNS. Different VPNs run their own DNS servers and if you connect to one of the VPN you can automatically use their servers. By doing so no one will be able to hijack your connection and thus your information will be well-protected. Such VPNs also make sure that the sites you wish to visit resolve properly and are not censored by the ISP or government. Currently, it has been observed that DNS hijacking is causing a menace in the Internet world. Not a single organization can be seen well-protected against DNS attacks. An example of DNS hijacking is the hackers’ group known as the Iranian Cyber army that took Twitter by storm. DNS is important in resolving the URLs you enter into the address bar of your browser. It is a sort of recurrent operation that aids your browser in getting the IP address of the website you wish to reach. The delay the browser takes while attempting to resolve the IP address, is used as an advantage by the hijacker. This results in DNS hijacking. The dangers of DNS hijacking may include the attacks of pharming and phishing. In order to avoid DNS hijacking, you can use good security software or you may change your DNS server. By following such basic steps you will be able to thoroughly protect yourself from DNS hijacking and surf the web without any sort of restriction of censorship!